Twenty years ago today, Challenger disintegrated into a fireball and took the lives of seven astronauts. I was 15 at the time and had not lived through any space program disaster: I have no memory at all of Ed White, Gus Grissom and Roger Chaffee. 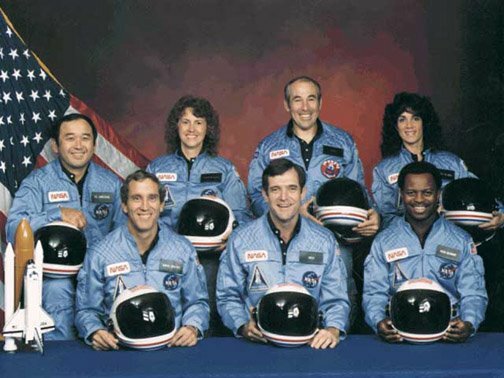 Yet I can remember their names without looking them up, while no name sticks to me from Challenger (or Columbia) except Christa McAuliffe. I do remember where I was. We were home from school, and my sister came away from the television to tell me that the space shuttle had exploded. Many hours were spent in front of the television that day, hearing the anchors speculate that the crew probably did not survive, and watching the fireball over and over again. 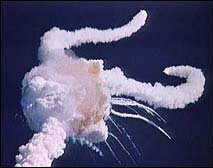 I remember Columbia's loss (above), three years ago this February 1, quite well -- but not necessarily better than the Challenger disaster. I walked into a grocery store on a Saturday morning, bought the NY Times, and looked up at a television playing the news. 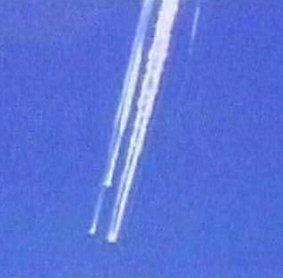 The anchor said that radio contact with Columbia had failed to be re-established after re-entry, and I think I gasped. Within a few moments I was thinking of a possible terrorist attack. Such were our thoughts then, a year and a half after 9-11, and little over a month before the eventual invasion of Iraq. But in the weeks ahead I just came to grips with the simple idea -- impossible for me to accept in 1986 -- that the shuttle was an unsafe vehicle. I do not think that the shuttle has been anything less than our most successful manned space program for earth orbit. And its contributions to unmanned programs like Hubble, Magellan, and Galileo -- all of which the shuttle delivered into space -- mean that its contributions to space science as a whole are indelible. I remember waking up early on a Sunday morning, April 12, 1981, to see the first space shuttle launch. I had been too young to remember the previous U.S. space launch (Apollo-Soyuz in 1975), so it was exciting, and one of the fondest memories of my childhood. 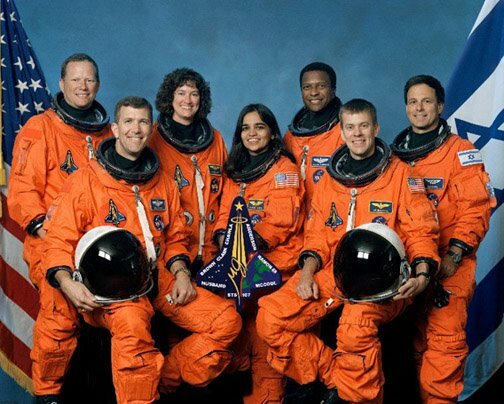 In those days I followed every launch of Columbia, every astronaut's name, and practically every orbit. Columbia was my favorite ship -- in space or otherwise. And I admired all the astronauts, John Young especially. Neither of the two subsequent disasters took the life of any astronaut that I knew much about (other than Christa), but I do hope that the shuttle is retired and that something safer takes its place. As an adult I have been able to imagine the final moments of the lost fourteen with more readiness than I had as a child or a teenager. There is something in these reflections that is more painful, and disturbing, than I allowed myself when I was younger. So I want to post their photos here, and to leave a reflection by Bruce Springsteen. It comes from his song, "The Rising," and was intended for the victims of the twin towers -- but I find myself thinking of it when I reflect on these losses. Nice tribute to the fallen astronauts.